The tibia is a large long bone of the lower extremity, connecting the knee and ankle joints. Osteologic features of the tibia include medial and lateral condyles, the tibial plateau, the tibial tuberosity, the soleal line, the medial malleolus, and the fibular notch. The proximal end of the tibia terminates in a broad, flat region called the tibial plateau. The intercondylar eminence runs down the midline of the plateau, separating the medial and lateral condyles of the tibia. The two condyles form a flat, broad surface for articulation with the medial and lateral condyles of the femur. The tibial tuberosity is a palpable bony prominence located on the anterior surface of the proximal shaft of the tibia. On the posterior aspect of the tibia, the soleal line runs diagonally in a distal-to-medial direction across the proximal third of the tibia. The lateral aspect of the distal tibia forms the fibular notch, creating an articulation between the distal tibia and fibula, the distal tibiofibular joint. The medial malleolus is the medial surface of the distal portion of the tibia. It is prolonged downward to form a strong pyramidal process and flattened from without, inward. The medial surface of this process is convex and subcutaneous. The lateral, or articular surface, is smooth and slightly concave, and articulates with the talus. The anterior border is rough, for the attachment of the anterior fibers of the deltoid ligament of the ankle joint. The posterior border presents a broad groove, the malleolar sulcus, directed obliquely downward and medially, and occasionally double; this sulcus contains the tendons of the tibialis posterior and flexor digitorum longus. The summit of the medial malleolus is marked by a rough depression behind, for the attachment of the deltoid ligament. Proximally, the tibia articulates with the femur to form the tibial-femoral joint of the knee. Distally, the tibia articulates with the talus to form the talocrural joint of the ankle. Although not functionally a part of the knee, the fibula articulates proximally with the lateral aspect of the tibia, forming the proximal tibiofibular joint. The distal tibiofibular joint is formed by the articulation of the distal tibia and fibula. There is relatively little movement at the proximal and distal tibiofibular joints. The primary function of the tibia is to accept and distribute weight across the knee and to the ankle. The tibia's articulations with the relatively non-weight bearing fibula serve to maintain alignment of the tibia. 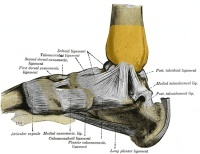 Distally, the concave surface formed by the medial malleolus of the tibia and the lateral malleolus of the fibula creates a stable enclosure for the talocrural joint. Fractures of the tibial shaft are most likely to occur at the inferior and middle thirds, where the bone is most narrow. Fractures of the tibial plateau are often related to high-impact trauma from motor vehicle collisions or sports. Osgood-Schlatter's Disease is a painful condition in adolescents in which repetitive strain of the quadriceps muscle on the tibial tuberosity leads to ossification and microavulsions. ↑ 1.0 1.1 1.2 1.3 Neumann DA, Knee. In: Neumann DA, editor. Kinesiology of the musculoskeletal system: Foundations for rehabilitation. 2nd ed. St. Louis, MO: Mosby Elsevier, 2010. p520-71. ↑ 2.0 2.1 2.2 Neumann DA, Ankle and Foot. In: Neumann DA, editor. Kinesiology of the musculoskeletal system: Foundations for rehabilitation. 2nd ed. St. Louis, MO: Mosby Elsevier, 2010. p573-626. ↑ 3.0 3.1 3.2 3.3 Moore KL, Agur AM, Dalley AF. Essential Clinical Anatomy. 4th ed. Baltimore, MD: Lippincott Williams & Wilkins, 2011.